It only happens twice a year, and this time we are on the losing end of the battle. However, if you live Arizona and Hawaii, you never have to worry about it. 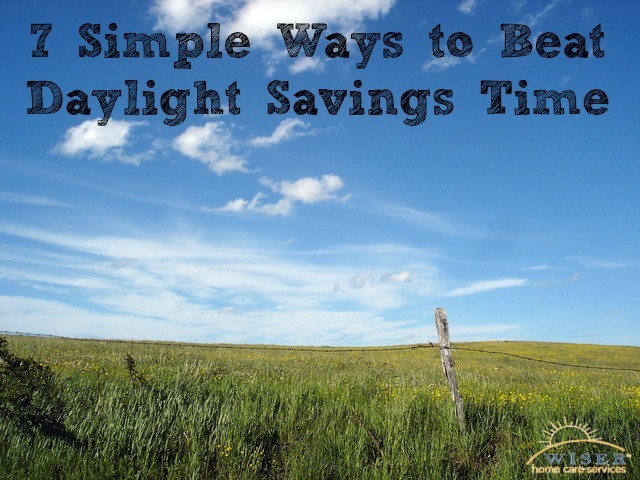 You may be wondering what we are talking about … its daylight savings time of course. As if coming back to work after a fun-filled weekend isn’t tough enough, this Sunday at 2 A.M. the clocks all rolled forward an hour. This time change often feels like we are losing an hour of sleep and the side-effects can sometimes be dangerous. In fact, research has found that car accidents, strokes and heart attacks all spike in the days after the Daylight Savings Time change. In addition, the time change is also linked to increased workplace injuries, increased web surfing, restless sleep and increased occurrences of cluster headaches. We have gathered 7 simple tips to ensure you and your loved one experience a safe time change transition this year. Part of what makes daylight savings time so tough is that we “lose” an hour of sleep over the course of 1 day. Adjusting your sleep schedule takes time. You should start by going to bed 15 minutes earlier each night the week before the change. Just like a toddler, if you feel tired during the day, give yourself the ok to take a quick powernap. When we say quick, we mean it. Anything over 20 minutes will make it worse. Did we mention prioritize sleep? You might be getting tired of us talking about sleep, but it really is that important during the time change. Listen to your body. Make sure you get 7-8 hours of consistent sleep. What and when we eat truly affects how we sleep. To make sure you get a good night’s sleep, you should eat at least 2-3 hours before you plan on going to bed. You will also want to make sure that the meal isn’t too heavy. Until your body gets used to the time change transition you should be careful about what you drink. Too much caffeine too late in the day could affect the quality and quantity of your sleep. In addition to coffee, you will also want to avoid alcohol as well. Getting out for some exercise is a great way to increase serotonin in your body. This natural chemical helps your body adjust to the time change. However, you will want to make sure you aren’t working out too late in the evening as this could affect your sleep negatively. Before you finally turn in for the night run yourself a nice warm bath, listen to some soothing music and maybe read a good book or magazine. Experts do warn about staying away from screens right before bed, since they also affect your sleep. As always, Wiser Home Care is here to help you with whatever you need, even if it means helping you get used to the time change. From providing care to developing an extensive care plan for your loved one, and everything in between, we are happy to help. Please contact us, and we will be happy to answer any questions you may have.